Cold, dry air from the north crosses warm, damp air from the south over the United States’ mid section, an area known as “Tornado Alley.” This is the only area in the world that regularly sees tornados. These storms occur in greatest frequency as seasons change in the spring and fall. A tornado struck the Arkansas Delta town of Caraway tearing down trees, utility poles, and power lines. A number of homes were heavily damaged. A beekeeper friend’s home sat in the storm’s path; it sustained minor damage. The beekeeper and his wife ducked safely into their storm shelter as the storm struck. Large trees fell around them. The beekeeper checked on family, friends, and bee hives; all survived the storm. Beekeepers often divide their bee hives among several bee yards to lessen the losses from catastrophic events like fires, floods, or wind storms. Caraway sits between the Mississippi River and the St. Francis Sunken Lands, a depression formed during one of North America’s most powerful series of earthquakes. In the winter of 1811 through 1812, earthquakes shook the area, transforming the surface of the land. The soil liquefied, and sand blew high into the air. The Mississippi River flowed backwards to fill large depressed areas which became lakes. Today, flooding in the St. Francis Sunken Lands area is controlled by a series of earthen levees, natural rivers, and man-made canals. South of Caraway where opposing winds crossed, two rivers cross in an amazing engineering feat. 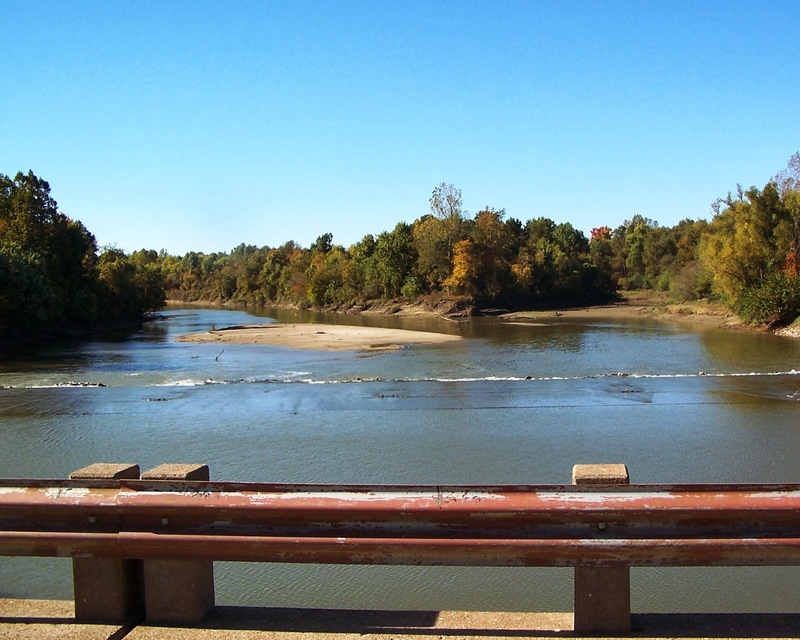 At Rivervale, Arkansas one river, a channelized canal, flows in a concrete tube under the St. Francis River. 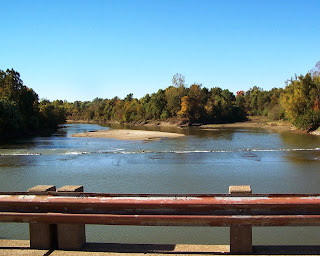 The rivers’ crossing can be seen in today’s photo. The concrete tube is visible horizontally under the surface of the St. Francis’ waters. Nearby, the Marked Tree Lock and Siphons are unique water control designs; the Siphons are the only structures in the United States where tubes are used to lift a river over a levee. The St. Francis River is lifted out of the Sunken Lands. Idaho’s Treasure Valley is an irrigated desert surrounded by mountains. The valley is the home to bees and beekeepers. Abundant flowering plants in urban and suburban landscapes plus a diversity of flowering agricultural crops supply bees with nectar and pollen in exchange for pollination. The result is fruit and seed. Warm fall days in the valley find large numbers of insects—both beneficial and pest. 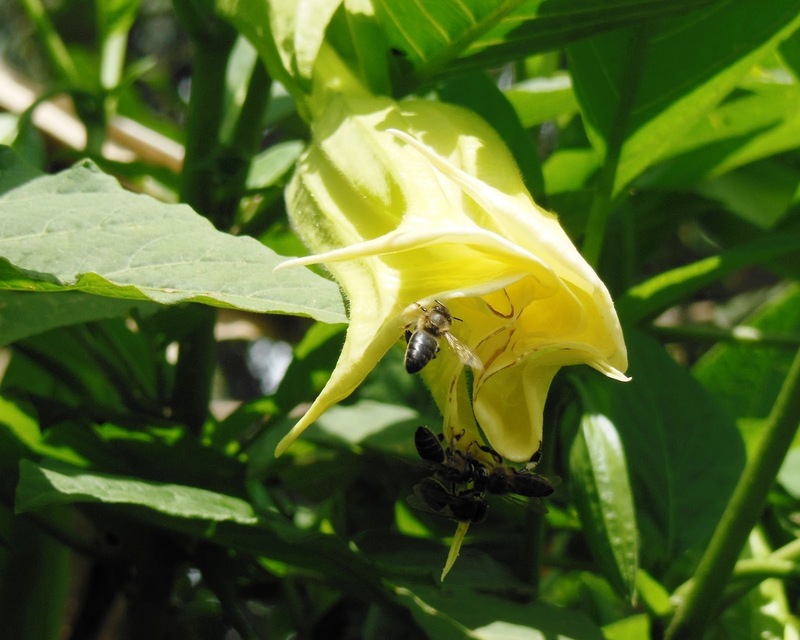 Flowering plants are heavily visited by honey bees, sweat bees, and numerous other small native bees. Yellow jackets, those dangerous and easily irritated ground-dwelling wasps, are in great abundance. Unlike honey bees which sting only to defend their nest, yellow jackets sting unprovoked. Flies are in such abundance that local stores can’t keep swatters in stock. Their numbers can probably be attributed to recent rainfalls moistening the waste from the area’s livestock. 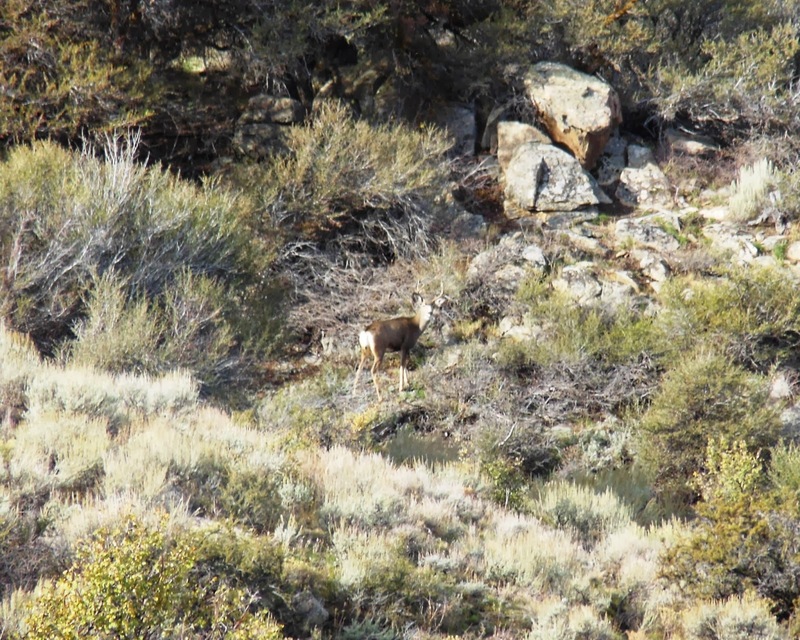 A day’s trip into the Oahee Mountains adjacent to the valley finds mule deer grazing on annual grasses greening the draughty mountain slopes. Here, along the old Oregon Trail we find abandoned gold and silver mines and the remains of miners’ cabins. 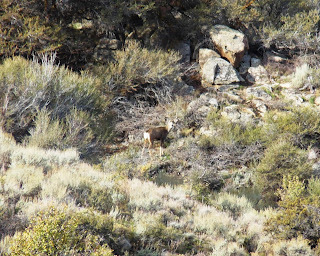 As we climb in altitude, fall flowers, scattered among the sage brush and junipers, do not reveal their pollinators—likely night-flying moths and bats. Willow and aspen trees grow below mountain springs. Beavers turn spring-fed streams into lush marshes, even at altitude in these volcanic mountains, named “Oahee” for “Hawaii” by their Hawaiian settlers. A trip into the Oahees reveals the delicate balance and interrelationship between the plants, mammals, insects, and other pollinators in this ecosystem of thin soil and scarce rainfall. The pollinators help produce the seed for plants which provide food for wildlife—deer, mountain sheep and goats, and wild horses—as well as herds of open-range cattle. The waste from the mammals carries nutrients high into the mountains to fertilize the plant life. Northern harriers soar across mountain slopes searching for small mammals gathering seeds. Unknowingly, through pollination, bees, bats, and moths feed hawks, cattle, and deer. Ethiopia has a rich tradition of beekeeping, and it seems to me that the country is like a patchwork quilt of beekeeping traditions. There is a mixture of beekeeping practices that follow the country’s diverse nectar sources and differences in geography. The local beekeeping techniques also follow the differences in beekeeping experiences of the farmers. Many rely upon the handed down techniques of traditional beekeepers. Some have been exposed to trainers from outside the region who introduced them to modern beekeeping methods. My experiences in Ethiopia found me working in some areas with beekeepers who had been exposed to training based upon bee biology. These individuals were comfortable with handling bees and were anxious to hear of new ideas that they could apply. I suggested that they should build Kenyan Top Bar Hives with standardized dimensions, like the one in today’s photo that I borrowed from the local agricultural extension agent to use in my training sessions in Amanuel. 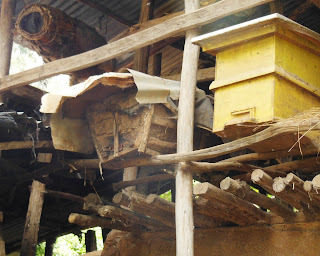 This top bar hive is built according to measurements adopted by the Peace Corps. By using standardized top bars and hive dimensions, the beekeepers can move combs from hive to hive. I explained to them that they can remove the queen from an exceptionally defensive hive and bring over a comb of very young brood selected from their best hive. With this resource, the bees can produce a new queen with different genetic traits. The farmers, well versed in selective cattle breeding, understood the concept of selectively improving their bees. I also worked in one area where the farmers had received inaccurate information about bee biology and agriculture in general. These farmers were fearful of the bees and highly reluctant to try my suggestions, especially opening the hives in the daytime. They gave many excuses for not doing this. Some said that they were too busy tending their cattle or plowing in the daytime. I suggested that they train other family members—women and children—to join in the beekeeping. Many of the farmers of Ethiopia rely upon harvesting honey and beeswax as part of their mixed agricultural income. The vast majority of their beekeeping experience involves placing traditional bee hives in trees or high places where they can attract swarms of bees. Once the bees have filled the traditional hives with comb and filled some combs with honey, the farmers drive the bees out of the hives with smoke and cut out the combs. The farmers then crush the combs to separate the honey from the beeswax comb. This technique often yields a low-quality honey. 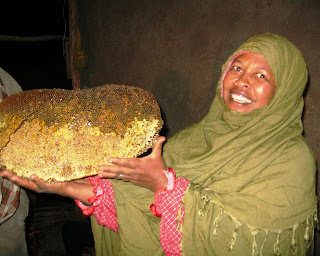 Today's photo shows an Ethiopian beekeeper proudly displaying a comb of honey that she cut from a traditional bee hive. The lower half of the comb contains high-quality, fully ripened honey, capped with beeswax. The upper half of the comb, however, contains brood along with pollen, bee bread, and unripened honey. If the entire comb is crushed together, the honey will be of very low quality, useful only for mead production. Throughout the world, much of the honey harvested in developing countries is used to produce mead honey wine. Uncapped honey that is not fully ripened and honey containing the protein of brood is suitable for fermenting into mead, however it is not acceptable as honey for storage and consumption. Fully ripened honey lasts virtually forever. By simply cutting apart this comb, this beekeeper can separate the high-quality honey from the lower-quality honey. Each can be sold separately. It is important that the beekeeper protects the quality of the bees' product. Heavy use of smoke used to drive the bees from traditional hives can alter the delicate flavor of honey. Storage in improper containers can impart flavors as well. Care should be taken to prevent overheating honey in storage, as this can change the honey's flavor and color. Most honey sold to consumers in Ethiopia is packaged as crystallized honey in wide-mouth plastic jars. The farmers deserve a good income for their beekeeping efforts. 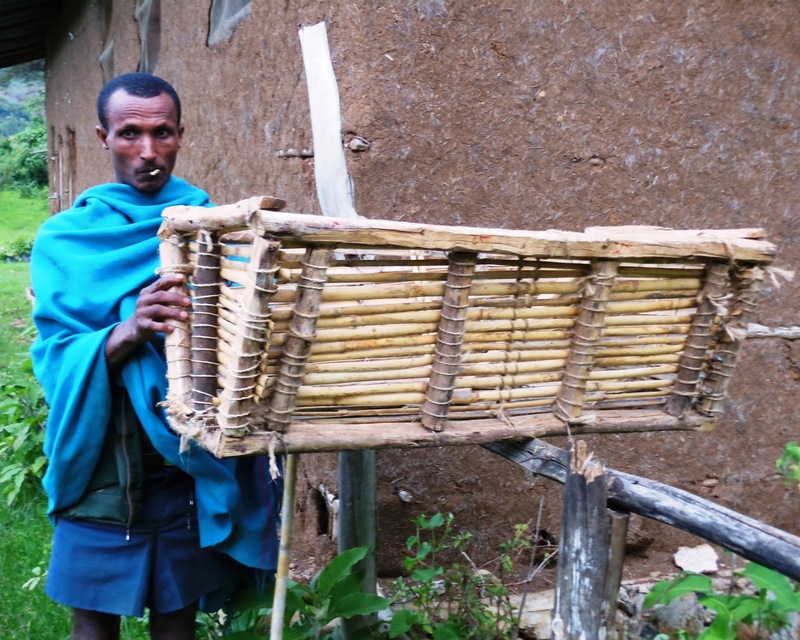 Gebeyehu is a most imaginative beekeeper. 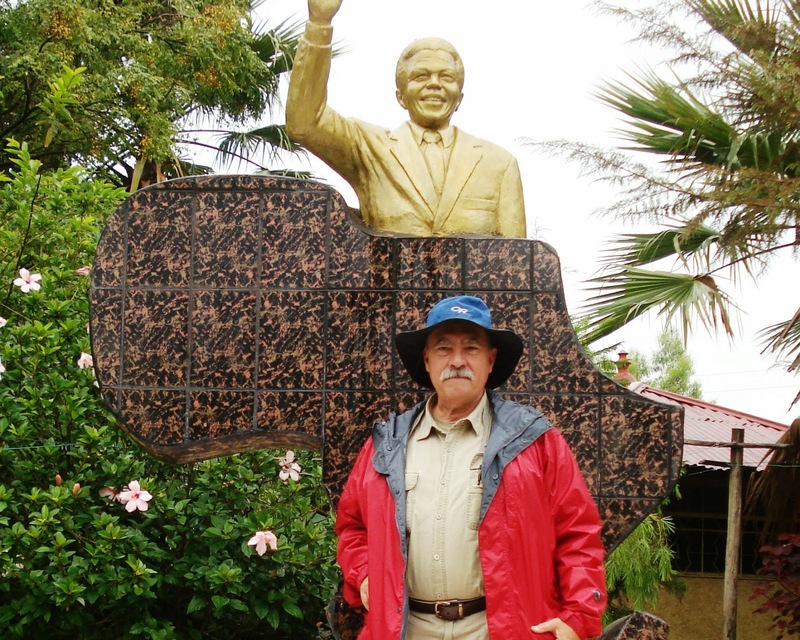 I had the pleasure of visiting his farm in Yewbush, Ethiopia. 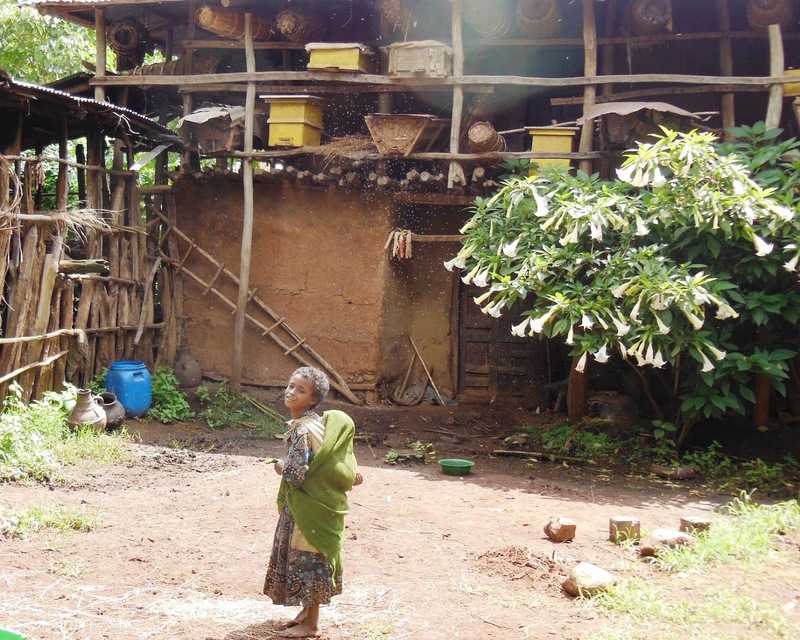 Gebeyehu designed his house to accommodate his family and his bee hives. The sturdy construction is like that of other Amhara farm houses. Eucalyptus poles are plastered with mud. Unlike most area farm houses, that are one story, Gebeyehu’s house is two stories. The upper story is smaller than the lower story, providing an elevated gallery all around the house under a broad, overhanging tin roof. This gallery, surrounding Gebeyehu’s second-story bedroom, holds dozens of bee hives. Three tiers of hive stands hold bee hives facing outward on all four sides of the house. There is space behind all of the bee hives for Gebeyehu to conveniently access the hives. Bees exit the hives in all directions from the second story, flying above the heads of children and adults in the yard. The broad, tin roof above the bee hive gallery shades the hives from the tropical sun. Gebeyehu’s house of bees contains all three types of bee hives in use in Ethiopia, traditional, transitional top bar hives, and modern. Gebeyehu has modified some of his modern Zander hives by connecting the hive bodies end-to-end instead of atop one another. This arrangement creates a horizontal hive with removable frames. From the outside, this modified Zander hive looks like a Tanzanian top bar hive. This hive gives the beekeeper the advantages of access without lifting heavy hive boxes. The hive is worked like a top bar hive, but it has the sturdy removable frames of a top bar hive. Two of these horizontal hives are visible on the second tier of hives in today’s photo of Gebeyehu’s house. Traditional hives are long cylinders built of cane. 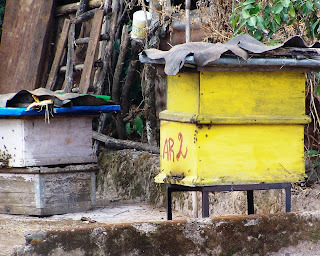 Modern Zander hives are upright boxes, usually painted yellow in Ethiopia. A small child tends to her infant sibling snuggled in her backpack while bees fly overhead. People and bees live in harmony here. To determine why some Ethiopian beekeepers are experiencing bee colonies absconding, or abandoning their hives, we look at each of their three types of hive. Honey bees will abscond if there is not enough forage in the area, and then the bees migrate to areas where food is available. This dearth of forage does not seem to be severe enough in some of the areas experiencing absconding. Honey bees will, however, abandon their hive if environmental conditions make the hive completely unsuitable for bees and developing bee brood. After evaluating the Ethiopian traditional hive, the transitional, or top bar hive, and the modern bee hive for size, ability to shed rain water, and ease of defense, we look at the ability of the bees to regulate hive temperature and provide ventilation. Here, we see several problems with the hive designs and the bees’ ability to maintain their hive’s internal environmental conditions. The traditional bee hive, usually constructed of cane, coated with mud or dung, and wrapped in banana leaves, is often plugged so that only a tiny opening exists for bees to enter and exit the hive. There is almost no through-ventilation inside the hive or space for bees to fan their wings at the entrance. The same lack of ventilation exists with both transitional and modern bee hives. Modern Zander bee hives, like the ones shown in today’s photo, are particularly lacking in through-ventilation. A small entrance is the hive’s only outside port. Air circulation in the top of the hive is difficult to maintain. Fortunately, this ventilation problem can be easily solved by cutting a screened hole in the back of the hive. Beeswax melts at temperatures around 145 degrees Fahrenheit, and there are reports of wax melting in Ethiopian bee hives. Since bees try to maintain a brood nest temperature around 95 degrees, such wax-melting hive temperatures make these hives completely unsatisfactory. Shade trees and hive stands with elevated roofs protect hives from the tropical sun. Beekeepers describe honey bees as having a defensive nature. They are not described as being aggressive. Bee behavior is such that guards will effectively defend their hive from intruders. Guard bees check all incoming bees and turn away those from foreign colonies. The guards spread alarm pheromone to alert other worker bees anytime the hive is invaded by insects or mammals. The combined effect of numbers of stinging workers effectively defends the bee hive with its queen, brood, and food stores of honey and pollen. Even though honey bees may rush out of the hive to drive away an intruder by inflicting numerous stings, honey bees do not aggressively hunt or attack people or animals. Honey bees are quite docile while they are away from their hive foraging. Today’s small, black honey bees foraging for nectar and pollen completely ignore children playing around the decorative plant’s flowers. The honey bees of East Africa have a reputation for being among the most defensive bees in the world. However, many of the colonies are not highly defensive. As part of my work in training Ethiopian beekeepers, I tried to encourage the farmers to work the bee hives gently in the daytime hours as opposed to their common practice of destructively harvesting the hives’ honey and beeswax at night after driving away the bees. Some beekeepers have good experiences and enjoy working their bees, and others seem to be reluctant to handling living bees. Only by examining bee hives in daylight can the beekeepers effectively observe the combs for brood diseases and other hive health issues. Our examination in Amhara of Ethiopia’s three types of bee hives finds that each is well designed to allow the guard bees to effectively protect the colony. Each hive has a small opening for an entrance, giving the guard bees the advantage of defending a small area. Ethiopia’s greatest bee hive pests are ants. Other invaders include wasps, hornets, birds, and small mammals including the honey badger. For bees living near the equator, dry and rainy seasons shape the bees’ year. The month of June sees the beginning of a four month rainy season in Ethiopia’s Amhara Region. A bee hive must be able to protect the bees from the elements. The hive must be designed and mounted so that it is protected from rain. 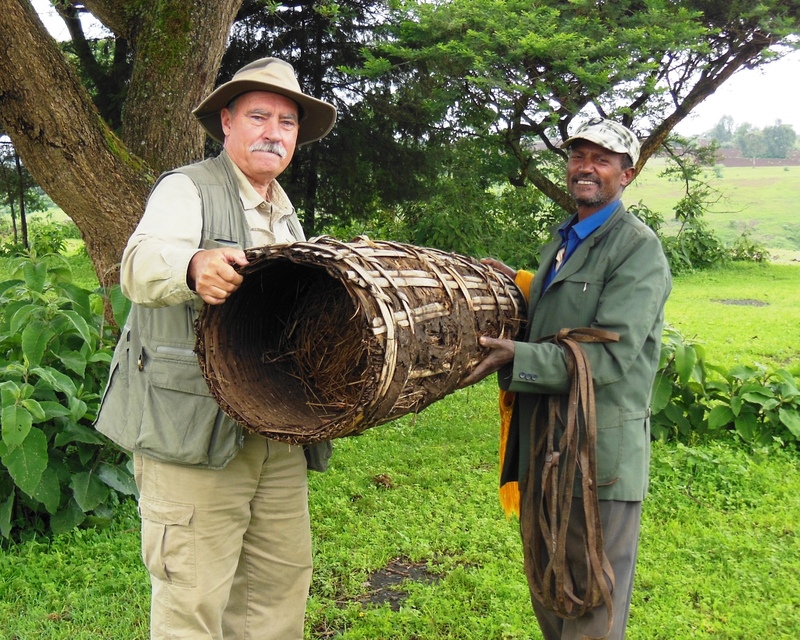 We examine each of the three Ethiopian bee hives to see if they are suitable in the rainy season. 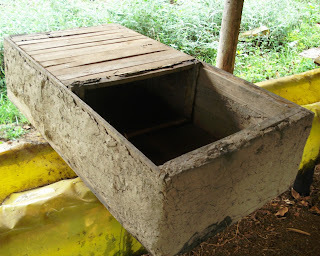 Traditional hives, though often covered with mud and dung, are usually wrapped with banana leaves, effectively shedding rain. Modern bee hives have a solid cover, making them quite rain proof. Only transitional hives, also known as top bar hives are vulnerable to rainy season problems. Traditional hives are mounted in trees, where they serve as effective swarm catchers. Some traditional hives are mounted on the walls of farmers’ houses, protected from rain by the overhanging thatch or metal roof. Modern and transitional bee hives are mounted on stands in the open. All three types of bee hives are at times mounted on stands with a covered roof as in today’s photo, which shows from left to right a traditional hive, transitional hive, and modern Zander bee hive. The roof above the hives provides for good rain protection as well as shade from Africa’s tropical sun. The space above the hives allows for good air circulation. Bees in transitional hives are most vulnerable to rain. Top bars are usually covered with some protective material. If the covering is a simple water resistant top, the hive is well protected. 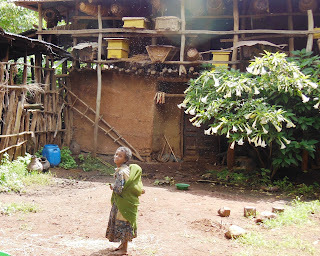 However, it is a common practice in Ethiopia to cover transitional top bar hives with a heavy layer of green leaves during the rainy season. While this traditional practice is meant to protect the hive from rainfall, it tends to hold moisture in and around the hive. The moisture adds to the development of chalkbrood, a fungal disease commonly afflicting Ethiopian bee colonies. Honey bees live in cavities. In Ethiopia, natural cavities are hollow trees or crevices in volcanic rock walls. 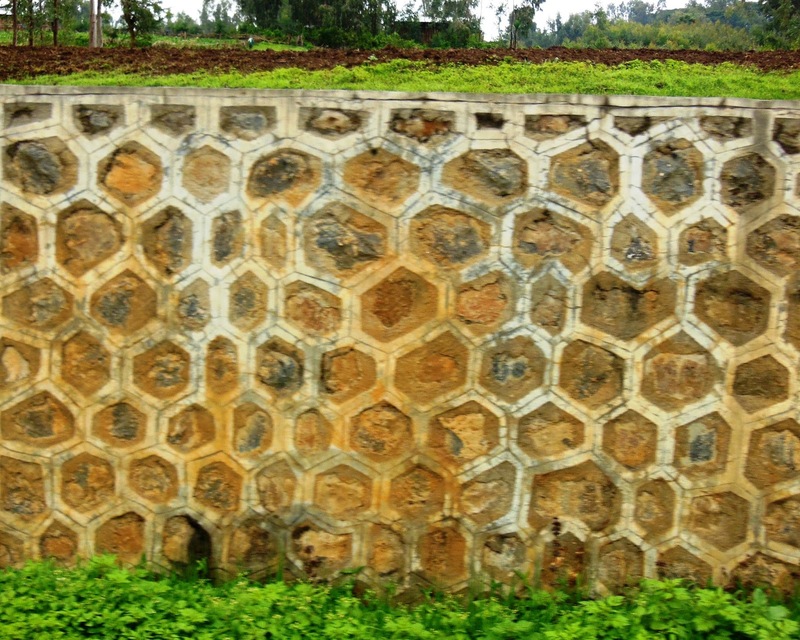 Ethiopian farmers also keep bees in three distinct styles of manmade hives. Traditional bee hives are long baskets, usually constructed from cane or strips of wood. Transitional bee hives, also known as “top bar hives,” are open baskets with strips of wood at the top to hold the bees’ combs. Modern bee hives are wooden boxes with removable frames to hold the bees’ combs. Honey bee colonies will generally maintain their brood nest in a hive as long as there is food available in the region and the hive remains suitable to the bees. To try to determine why the Amhara beekeepers are experiencing their bees' absconding and swarming, we look closely at each of the three manmade bee hives. The first concern for a bee hive to be suitable for the bees is its size. For the farmers to build up a population of bees capable of producing a surplus of honey the hive must be large enough for the bees to greatly expand their brood nest. In nature, bees often select a cavity with a volume of about 40 liters. After the colony fills this volume, the colony divides; and half of the bees swarm in search of another cavity. We measure traditional and transitional hives and find them to have a volume of about 89 liters. A modern Zander hive with two brood nest boxes measures about 84 liters, probably a suitable volume. It appears that the use of a single Zander brood nest box by some farmers probably leads to brood nest congestion and swarming. 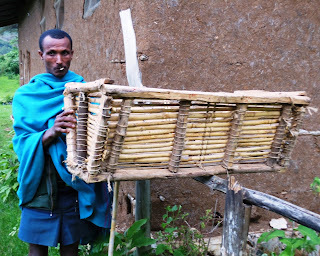 The Amhara farmers recognize that they might be able to reduce swarming by adding more hive boxes and frames as bee populations grow. In today’s photo, seasoned Ethiopian beekeeper, Gebeyehu, brings one of his traditional bee hives to the Machakel training facility for us to examine. Hive size is important wherever we keep bees. Ethiopia’s Amhara Region is a day’s drive northwest of the capital city of Addis Ababa. Farmers in Amhara, like farmers throughout Sub-Sahara Africa, rely upon honey bees to provide an important part of their farm income. They recognize that the honey bee alone has the ability to harvest pollen and nectar from forests and pastures and produce valuable products of honey and beeswax. The farmers of Amhara asked for assistance. I accepted the USAID-funded assignment of Winrock International to assist the farmers gathering at The Hunger Project-Ethiopia’s Machakel agricultural training facility. The farmers explained that when they harvested honey and beeswax, their product was judged to be of low quality; and their beekeeping added little to their incomes. Despite their best efforts, their honey and beeswax yields seemed to continuously dwindle. Those keeping bees for long periods expressed that beekeeping was easier and yields were greater 15 years earlier. In fact, many of the bee hives that farmers owned sat empty of bees. Many of the farmers blamed herbicides for killing their bees. While some herbicides are used by farmers in an effort to increase production on plowed fields, most fields in the Amhara highlands are plowed by oxen and cultivated by hand ax. Herbicides seemed to me to be an unlikely cause for the farmers’ plight. While herbicides kill weeds and reduce this source of forage for bees, the chemicals themselves are generally considered to be safe for bees. The Amhara farmers also complained of their losing bees to two common activities of tropical honey bees: absconding from the hives and reproductive swarming. I felt like an investigation into the farmers’ bee hives and their beekeeping practices might help explain these losses. The agricultural fields of Ethiopia’s highlands are interrupted by two of the world’s magnificent river gorges, the Jamma and the Blue Nile. Approaching Machakel, rock walls built of six-sided crystals of volcanic columnar basalt line the paved road offering a honeycomb pattern to this land of bees. All of America’s bee colonies have been lost twice in the last six years. That is the effect of the 30 to 35 percent annual honey bee colony losses since 2006, the year Colony Collapse Disorder was identified. The Bee Informed Partnership’s “Winter Loss Survey 2012—2013: Preliminary Results,” http://beeinformed.org/2013/05/winter-loss-survey-2012-2013/, reveals, “On average, US beekeepers lost 45.1 % of the colonies in their operation during the winter of 2012/2013.” Beekeepers do not feel that annual colony losses of one third are sustainable. Surveys point to losses above 15 percent as being unacceptable. Beekeepers consider the labor costs and expenses involved in cleaning the hives of dead colonies and the resources consumed in rearing replacement queens and colonies. Anecdotal evidence indicates that individuals may experience losses well exceeding the average. One commercial pollinator states that he actually loses and replaces all of his colonies in a year’s time. The USDA presents the report, http://www.usda.gov/documents/ReportHoneyBeeHealth.pdf, compiled from the October 2012 conference in Alexandria, Virginia of numerous stakeholders in honey bee health. These include honey producers, commercial pollinators, chemical producers, extension agents, researchers, and agents of the USDA and Environmental Protection Agency. The report provides an in-depth listing of current knowledge of honey bee health matters; and it offers a number of serious questions asking for further research. I hope that many of these will be addressed. The conference stakeholders address honey bee nutrition, pests and pathogens, pesticides, genetics, breeding, and biology. Best management practices are being explored. Teams of concerned stakeholders in honey bee health are gathering information, and beekeepers are working to rebuild colony numbers. Queen bees developing in queen mating nucleus hives will start new colonies to replace winter losses. A check of queen cells in today’s photo shows two queens emerged successfully from their peanut-shaped cells. The cell on the right remained closed; its queen did not emerge. The newly emerged queens will make mating flights and then begin laying eggs in two to three weeks. Beekeeper Doug Cleveland and I sit by the wood stove of his Idaho wood shop and compare beekeeping in Idaho’s Treasure Valley with that in the Arkansas Delta. Doug is the president of the large and active Treasure Valley Beekeepers Club with commercial operators, sideliners, and backyard beekeepers gathering in Boise. Treasure Valley is protected by surrounding mountains. Although considerably farther north, the valley’s winter conditions are similar to those experienced in the Arkansas Delta. Treasure Valley, a high desert, supports a diverse agriculture through the use of an extensive system of irrigation canals that carry water from melting snow in the mountains. Throughout the valley, I see pallets of bee hives. Honey bees pollinate large fields of peas, beans, and mint. Treasure Valley spearmint is grown for its aromatic oil in 40 acre fields. Blue wooden boxes house alkali bees that pollinate alfalfa fields cultivated for seed production. 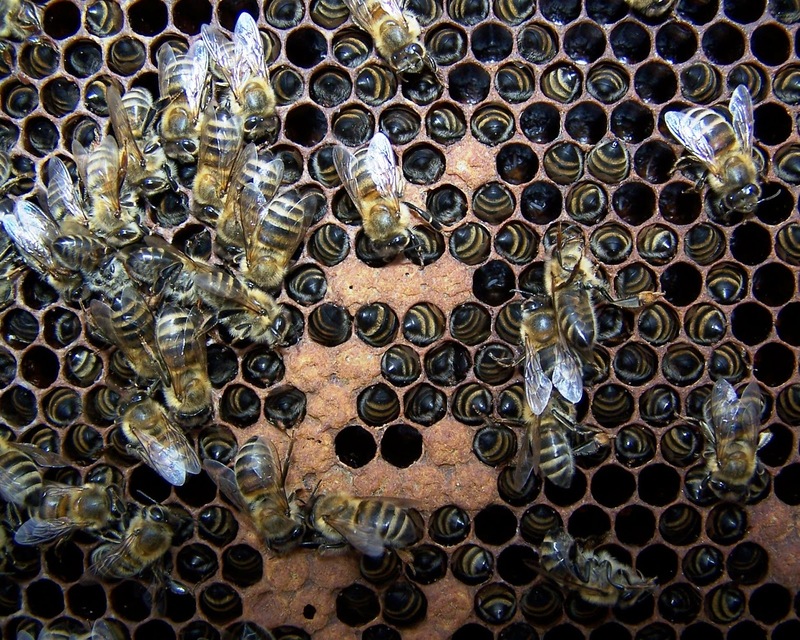 The assembly points of commercial beekeeping operations today are littered with dead colonies. Recent reports show over-winter bee colony losses of 50 percent or more. See http://www.nytimes.com/2013/05/03/science/earth/government-study-cites-mix-of-factors-in-death-of-honeybees.html?hpw. Numerous factors seem to lead to the heavy losses of bee colonies, including queen failure, starvation, parasitic mites, winter weather conditions, Colony Collapse Disorder, pesticides, Nosema disease, small hive beetles, and general colony weakness. This US report comes as Europeans ban neonicotinoid insecticides, widely questioned as leading to honey bee colony decline. See http://www.nytimes.com/2013/04/30/business/global/30iht-eubees30.html. Having the systemic insecticides banned in Europe while extensively used in North America, there is the opportunity to make comparisons and study the effect these insecticides have upon honey bees. Let’s hope that independent researchers can learn from this two-year break in neonicotinoid insecticide usage. Doug Cleveland and I share many beekeeping techniques. We both rely upon the hygienic behavior of resistant strains of bees to remove parasitic mites from the hives. We avoid harsh chemicals, and we both use thymol, derived from the oil of the thyme plant, to reduce colony mite loads. 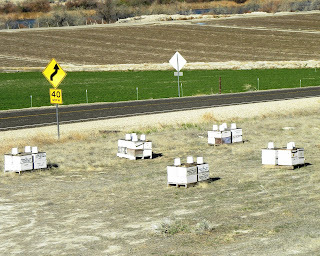 Today’s photo: Treasure Valley bee hives. Wild plum trees are the first white-blooming trees seen in the forest in the early spring. The white blossoms of plums and pear trees often mark abandoned pioneer home sites. 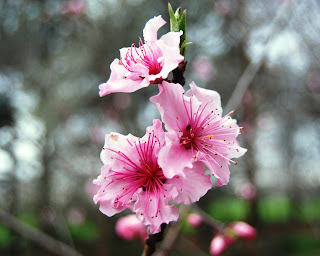 These are the first of a number of flowering fruit trees to bloom in the Mid-South. Their bloom is an important milestone on the beekeeper’s calendar. With the start of the fruit tree bloom, beekeepers expect to find prolific expansion of the bee colonies. 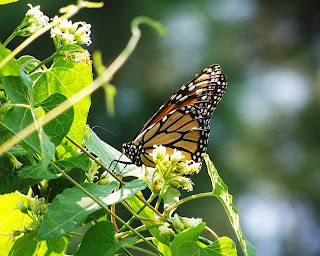 Abundant nectar and pollen from plum, pear, apple, peach, cherry, and crabapple blossoms along with other emerging wildflowers stimulates the queens to lay eggs. Many of these fruit trees rely upon honey bees to cross-pollinate the blossoms with pollen from similar tree varieties to produce fruit. The peach, as in today’s photo, is an exception. Most peach varieties are self-fruitful; they produce fruit without the assistance of honey bees. This is fortunate today, as cool weather keeps the bees in their hives. The peach tree I find today, growing on an old farmstead, has no bee visitors. Early spring weather in the Mid-South is often unsettled. Effective pollination of fruit trees may be limited by cool or rainy days that prevent bees from flying. The New York Times reports honey bee colony losses in 2012 at 40 to 50 percent, an increase over recent years. 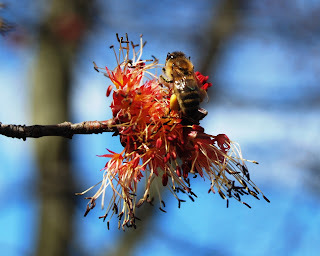 See http://www.nytimes.com/2013/03/29/science/earth/soaring-bee-deaths-in-2012-sound-alarm-on-malady.html?_r=2&. 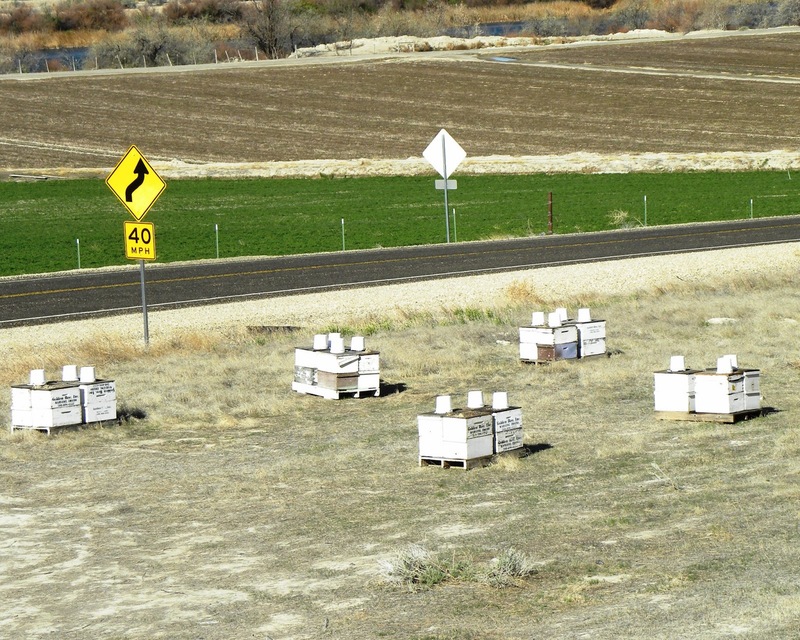 Colony losses at this level seriously affect commercial beekeeping and fruit production. The majority of honey bee colonies in North America are used for crop pollination service. Many beekeepers suspect the systemic neonicotinoid insecticides in widespread use to control insect pests on crops as contributing to honey bee colony losses. The insecticide manufactures deny that their products are responsible for the bee die-off. Independent testing will be necessary to prove the safety of this new class of insecticides. Further study is also needed to determine the effect on bee health resulting from the interaction between the many environmental chemicals from pesticides to herbicides to fungicides encountered by foraging honey bees. A Minnesota beekeeper checks his hive and finds plenty of bees and ample stored honey. Shortly afterward, cold weather set in for several days. Two weeks later, he finds the bees in the hive are dead even though the hive still holds plenty of honey. March is often the harshest month for honey bees. Bee populations are growing; the increasing population of bees requires a lot of food; the hive's food stores are rapidly diminishing; and there are not many flowers blooming for bees to forage. On warm days, worker bees may expend more energy searching for food than they would consume if they remained in the hive. Also, when there is brood in the hive, the bees must warm the brood nest to 95 degrees Fahrenheit, requiring the consumption of honey to generate heat. The most likely cause of the death of the Minnesota bees is starvation. Starvation is easy to identify; the beekeeper finds the dead bees clustered with dead bees head-first inside empty cells as in today’s photo. Often, ample stores of honey surround the dead, starved bees. In starvation, here's what typically happens: The bees expand their winter cluster on warm days and contract the cluster on cold nights. On warm days the bees eat the stored honey surrounding the cluster. Then, when outside temperatures fall, the cluster contracts leaving a ring of emptied cells surrounding the bees. If the winter colony has no brood, the cluster may move about the hive. However, if there is brood present, the clustered bees will not move away from the brood. During a prolonged period of cold weather the bees remain tightly clustered, and they can't move the few inches to the stored honey. Because the colony shares food, all of the bees die when the colony runs out of food that they can access. If beekeepers detect a hive is short of food stores in late winter, they can provide emergency feeding of dry sugar or fondant candy. Fall and spring hive management in top bar hives is similar to that of Langstroth hives. Bees tend to build their brood nest in a top bar hive near the hive entrance and expand horizontally with new combs. Two combs holding honey and pollen near the hive entrance provide food for the brood. Hive manipulations can be visualized as if a Langstroth hive is lying on its side. Just as the beekeeper moves the winter cluster downward in the fall in a Langstroth hive, he or she moves the cluster forward toward the top bar hive entrance. Over winter, the bees move horizontally away from the entrance into the honey storage combs. In the spring, empty combs near the entrance should be moved to the rear, and the brood nest pushed toward the entrance. All bee hive manipulations of modern hives can be accomplished with top bar hives if the bees build straight combs centered on the top bars. Carefully built top bars of 32 millimeter width are necessary for comb management. If the bees build combs connecting the top bars, the hive can’t be easily manipulated. Bees tend to curve their combs toward the hive entrance. Cutting away curved portions of combs encourages the bees to build straight combs centered on the hive's top bars. Ethiopian beekeeper Teshome recognizes that by building top bar hives of standardized dimensions he can move combs between hives. This allows him to de-queen poorly performing colonies or those with defensive behavior and bring in combs of eggs and larvae from his best colonies to control and improve bee genetics. He can also rear new queens and make colony divisions in his top bar hives. Today’s photo: a mud and dung coated Tanzanian top bar hive in use in Ethiopia. The Tanzanian hive design employs vertical box walls. This rear view shows one empty frame behind top bars. Under a thatched roof, the hive stand’s plastic sheeting and oiled posts protect hives from ants. Beekeepers are making preparations for adding new colonies in the spring. While most will house their bees in modern bee hives, some will chose hives of other designs. 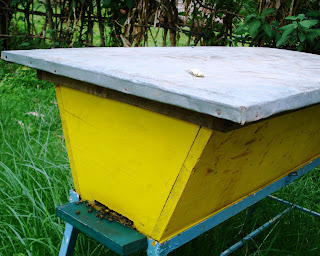 The Kenyan top bar hive is the choice of a number of hobbyists who want to keep a few bee hives at their home. This removable comb hive is simply a box with sticks, called top bars, to hold combs. A benefit of top bar hives is that they can be constructed at low cost from locally available materials using ordinary hand tools and simple building skills. Larry Tomkins, a knowledgeable beekeeper from Northeast Arkansas, shared his top bar beekeeping experience with the Arkansas Beekeepers Association. Tomkins, who began beekeeping with Langstroth hives, explained how he enjoys building top bar hives that he constructs from scrap lumber. Tompkins uses the hive design developed by the Peace Corps, http://www.tc.umn.edu/~reute001/Plan%20files/pTop%20bar%20Kenya.pdf. Tompkins built the top bar hive that he brought to the ABA Spring Conference for 79 cents, the cost of screws. There are no standardized top bar hive plans; there is only one critical measurement: Top bars must be 32 millimeters in width. A beer bottle cap makes a handy measuring device for constructing top bars. Building top bars of the proper width is important for maintaining bee space. 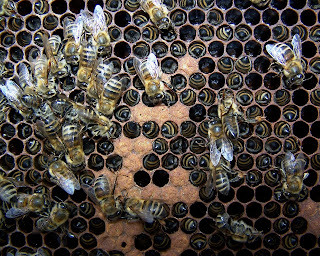 Bees build cross combs on improperly designed top bars. Top bar hives are attractive to some beekeepers because, unlike modern bee hives, there are no heavy boxes to lift. All hive work is accomplished at a comfortable waist-level height by removing one comb at a time from the hive. Since harvesting of honey from top bar hives involves destroying the honeycomb, old beeswax is continuously replaced in the hive. 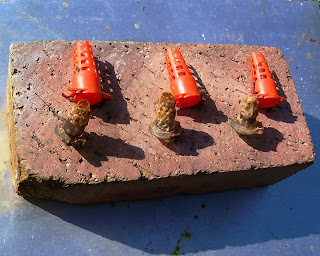 Comb replacement is good for colony health; environmental chemicals and bee disease spores are removed from the hive. Today’s photo is a Kenyan top bar hive in use in Ethiopia. The annual Farm to Table Conference held in Memphis at Rhodes College is designed to bring together farmers and those who buy and use their produce. I conducted an introduction to beekeeping session attended by a number of farmers considering adding bee hives for pollination. The farmers conducting other sessions spoke along common themes: sustainable agriculture, quality of produce, food security, and integrated pest management. Sustainable agricultural practices include irrigation water usage and conservation, soil erosion control, and soil moisture retention. Several farmers spoke of the effects of climate change on farming practices. Climate change especially affects water usage and plant variety selection. Certain plant varieties known to be reliable in the past must now be replaced by a diversity of varieties that thrive under new environmental conditions. Climate change also affects planting dates, growing seasons, and harvest dates. To grow high quality produce, the farmers stress testing for soil fertility, acidity, and nutrients. Integrated pest management involves disease and pest prevention and control. Specific crop pests must be identified, and broad-spectrum insecticides should be avoided. Non-chemical controls include selection of resistant plant varieties, crop rotation, removal of diseased plants, and mulching between crop rows. Robert Hayes, a New Albany, Mississippi blackberry grower, who also manages bees to pollinate his berries, attracts hummingbirds to his farm. Adult hummingbirds feed crop-damaging thirps and aphids to their young birds, a biological pest control. Farmers recognize the need for beneficial insects, particularly honey bees, to pollinate their crops. As well as keeping honey bees, Hayes drills nesting holes in dead trees to make nesting sites for blue orchard bees, effective native pollinators. My presentation to the other farmers explored the reality of maintaining honey bees on today’s farms. It is unfortunate that with the high level of annual colony losses beekeeping can hardly be called sustainable agriculture. The farmers’ awareness of agricultural practices that help and harm bees is important. Cool weather today prevented honey bees from foraging elm trees in full bloom. There are several milestones in the beekeeping year that we follow to give us an indication of what the bees are doing. Some of these milestones are the changes in seasons that we follow on our calendar. We know that queen bees start laying eggs after the winter solstice, December 21. Other milestones involve the bloom of major nectar and pollen sources. I always look for the red maple bloom. Maples and elms bloom in late winter. The weather at this time of the year is often unsettled. If the weather is cold when these trees bloom, the bees don’t fly; and they miss the reward of nectar and pollen. On warm days, bees head to the river bottoms to forage from flowering trees. Today, warm temperatures brought bees out in great numbers. 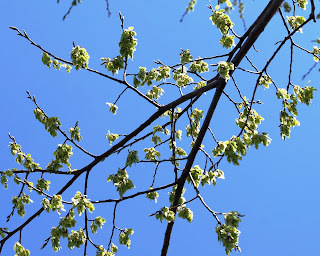 Red maples growing in plains above rivers were covered with honey bees and native bees, including small, brightly colored sweat bees, native bees that forage close to their nest. Honey bees, like the one in today’s photo, travel great distances to river bottoms to fill the pollen baskets on their hind legs with dull yellow-colored red maple pollen. The sudden surge in pollen being brought into the hives is a strong stimulant to the queens to start laying eggs. Other early season plants in bloom include the skunk cabbage located in damp soils of forest margins and dandelions in pastures and lawns. From the nectar, the bees collect carbohydrates; from the pollen, the bees derive protein, fats, vitamins, and minerals. Having a mixture of available pollens ensures that the bees will have a complete diet to feed their brood. The red maple milestone tells the beekeeper that the first nectar and pollen flows are beginning, and hive activity is ready to start increasing rapidly. As brood production expands, beekeepers need to monitor for hives that are light in weight and supply emergency feeding. If stored honey is depleted, late winter nectar sources may not be sufficient. The bee hive in the fall is full of bees, brood, and food. However, by mid-winter, the hive is partially empty. Short-lived summer bees are gone; drones have been ejected; the year’s last brood has emerged; and a significant amount of the food stores have been eaten. The cluster of bees is slowly moving upward in the hive. As the bees eat their honey stores, they leave empty cells. The hive may have half of its cells empty. The empty air-filled cells make excellent insulation from cold winter drafts. Actually, little wind blows through the parallel sheets of bee hive comb. If they are able to enter, mice find bee hives a welcoming home in the winter. Mice are known to build nests in the lower corners of bee hives. They are actually a greater nuisance to beekeepers than to the bees. If worker bees find a mouse inside the hive, they often sting it to death. Since they can’t drag the mouse outside, they entomb it in propolis. This prevents the spread of odor and bacteria throughout the hive. 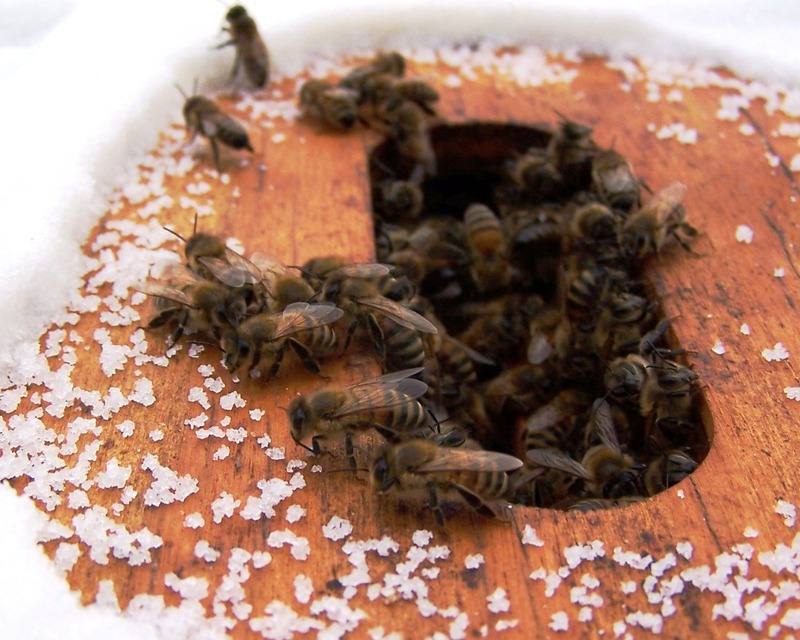 Beekeepers reduce the size of hive entrances in the winter to help keep mice out of the hive. Rodent populations, like those of many insects, expand widely every few years. This year, large populations of field mice and rats were observed over a wide area. 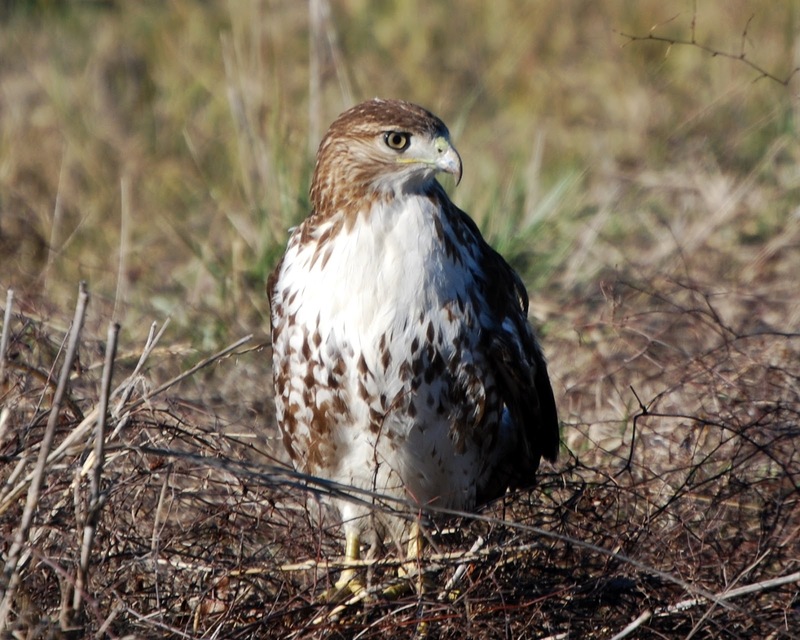 Hawks and owls, birds of prey, are effective natural predators of rodents. Red-tailed hawks are common hunters throughout North America. Easily identified by their bright white breast feathers, they often perch on a low tree limb or fence post while waiting for a rodent to move. Then, they swoop down and grab their prey with sharp talons. The red-tailed hawk in today’s photo is frequently seen hunting on the ground in one Peace Bee Farm bee yard. Today, I found four nesting boxes occupied by sleeping screech owls, highly efficient night-time mouse catchers. Year-around, birds of prey help to control bee yard rodent pests. A beekeeper in Minnesota is carefully measuring the temperature inside his bee hives. He recorded a daytime temperature of 70 degrees Fahrenheit and a nighttime temperature of 38 degrees. He asks me what I think of the temperature differences, and he asks if I feel that there is a problem. While Minnesota experiences extremely cold winters, honey bees are very capable of regulating the atmosphere of their hive. They also employ measures to conserve energy and food reserves necessary to survive harsh northern winters. First, they do not attempt to warm their entire hive, only the bees and brood. The bees form a cluster to generate and conserve warmth. Loosely packed bees inside the cluster generate heat by eating their high-energy food, honey, and “shivering” their flight muscles. These bees can create about 104 degrees in their muscle tissue. Bees on the outside of the cluster form a tightly packed crust to hold in the generated heat. As bees on the outside chill, bees from the inside change places with them. The bees are not wasteful of honey stores needed to feed the workers generating heat. They do not attempt to warm the entire hive, just the cluster of bees. The bees’ second honey conservation effort involves lowering the cluster temperature whenever there is no brood present. Brood must be kept warmer than adult bees. Brood is held at 95 degrees Fahrenheit. A number of races of bees, especially those originating in northern Europe and Asia, restrict the feeding of their queen to force her to stop laying eggs in the winter. When the colony is not tending brood, it lowers its colony cluster temperature to around 70 degrees, the daytime temperature measured in the Minnesota hive. The temperature of the hive outside the cluster drops at nighttime. In today’s photo, we see bees gathering granulated sugar that I placed for emergency feeding atop a hive’s inner cover. Bees access the sugar through the inner cover’s center hole. First, for the person attempting to call me on the phone, I am not able to hear you over the international connection. I will gladly respond to an email message to peacebeefarm@gmail.com. Please use the subject line to help me identify you. A friend writes asking about creamy white honey. I explain that the color of honey comes from the flowers that bees visit to collect nectar. Honey that is quite clear in color is described as “water white.” This is the lightest natural color of honey, which ranges from nearly clear through amber to dark brown colors that are almost black. If honey is white and opaque, it probably contains crystallized sugars and likely particles of beeswax, both quite acceptable in raw honey. Most of the delicious valonia honey that I ate in Africa was white in color, creamy in texture, and opaque. The color, clarity, and texture of honey don’t affect its quality. They just make for more variety in the honey we taste and enjoy. Winter is a good time for enjoying the birds along North America’s central flyway. 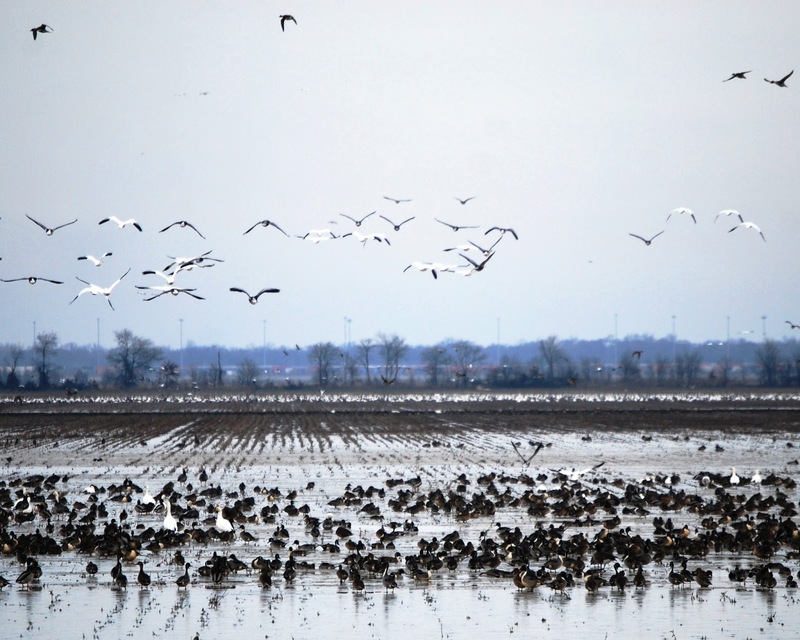 Migratory birds abound in the Arkansas Delta at this time of the year. Mile-long strings of snow geese pass overhead throughout the day. 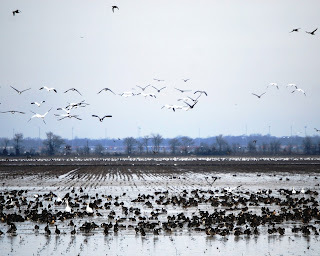 Harvested soybean and rice fields, impounded to hold water, attract pintail, northern shoveler, teal, and mallard ducks as well as white-fronted geese. Shown in today’s photo, the snow geese in the distance cover the ground. Along with their color phase, the blue goose, they appear as dirty snow. The gregarious snow geese congregate in flocks numbering in the thousands. Wintering waterfowl, fattening on spilled grain and aquatic invertebrates, help farmers by efficiently sifting weed seeds from the muddy soil. Bald eagles visit Peace Farm lakes, occasionally snagging a fish or duck. From dawn to dusk, red tailed hawks and northern harriers effectively thin the population of field mice and rats. Owls work the night shift, unseen. Winters in the temperate Mid-South are not continuous. There are cold periods interrupted every few weeks by mild days. Even though this region’s coldest months are January and February, it is not uncommon for winds to shift from north to south to bring a few warm days, a January thaw. These breaks in the weather give honey bees an opportunity to break out of their winter cluster to eat food stores in the hive, make cleansing flights, and even scout for food to forage. 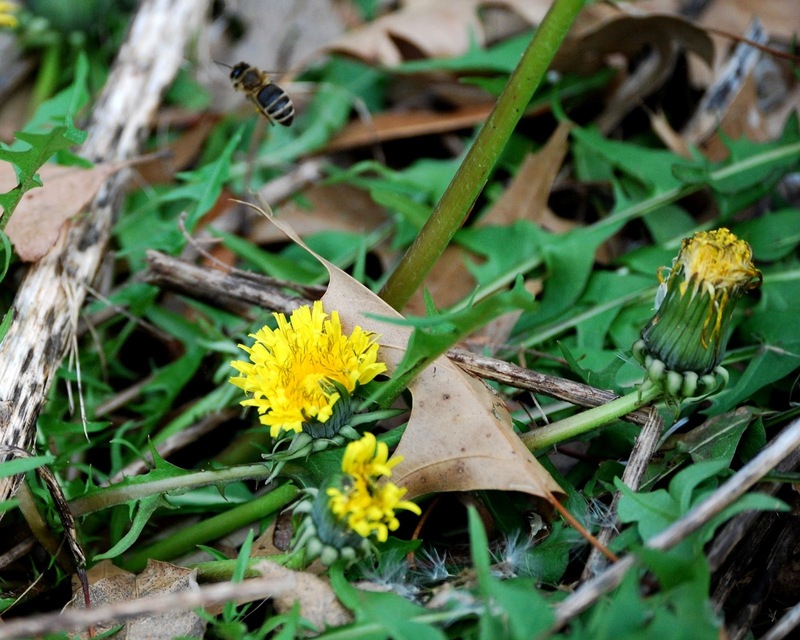 Today, I found the first wildflowers of the year in bloom, dandelions. 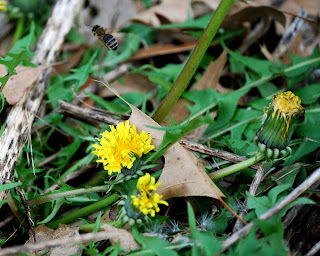 Winter bees often forage dandelions for pollen. Warm days also give beekeepers a chance to make a brief check of bee hives. With temperatures above 50 degrees Fahrenheit and no strong breezes, it is safe to open the cover of the hives and peer inside. We don’t, however, want to make a deep inspection of the hives until the temperatures warm considerably. Today, with warm temperatures and mild breezes, I lifted the hives a couple of inches from the rear to feel the weight of each hive. I then checked the food stores on light weight hives. Most hives held a full box of capped honey above the cluster of bees. In one hive I found the cluster had moved to the very top of the upper box. Bees located in this position during mid-winter are quite vulnerable to die from starvation. Even though the hive contained plenty of honey, colonies often do not move through the hive to access the food as they need it. Clusters of bees tend to move upward in the hive during winter months and not downward. Breaking apart a hive in cool weather may chill the bees and any brood. Rearranging a hive in mid-winter is also risky. Emergency feeding helps protect vulnerable colonies. Today, I poured several pounds of granulated sugar atop the inner cover of the hive for the bees to access from the center hole.